Some of my favorite elementary school memories are of teachers reading aloud from great books. I remember The War with Grandpa (Smith), Mrs. Frisby and the Rats of Nimh (O'Brien), The Egypt Game (Snyder), and From the Mixed of Files of Mrs. Basil E. Frankweier (Konigsburg.) I took a trip to the bookstore during Mommy Time not long ago and stood in the children's section, awash in memories. I could have spent hundreds stocking up on things I couldn't wait to read to my kiddos. We've read aloud every day since Syd was teeny tiny and have bookcases full of picture books. And although I've tried reading aloud from chapter books before now, they may have been a bit young. Probably depends on the child. Anyhoo, Syd turned 6 (!!) yesterday and Brenna is 4 and a half. So now I read a couple of picture books to them and then a chapter each night from whichever book we're working through. And they have really gotten into it. 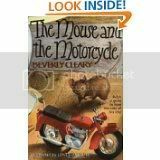 We began with the classic The Mouse and the Motorcycle by Beverly Cleary. I love anything by Beverly Cleary, I really do. I filled my summer reading program library quotas during my childhood with Ramona, Henry and Beezus, Ribsy stories, and even the lesser known Ellen, Otis and Emily stories. Love me some Beverly Cleary. I choose the Mouse and the Motorcycle book because Brenna loves animals of any kind, and because really... who can resist the idea of a mouse riding a toy motorcycle? Not me. And not them. After initially being disappointed in the scarce pictures present in the paperback, they settled into the idea. Syd flopped over the dog on the floor and Brenna next to me. Ralph has his own series, but I wanted to change it up a little. Mrs. Piggle Wiggle, friend to all the chlidren in the neighborhood, has an arsenal of cures to help parents solve their children's bad habits. Never-want-to-go-to-bedders, the answer-backers, won't share, won't take a bath, tiny bite takers... Mrs. Piggle Wiggle has a "cure" for everything. 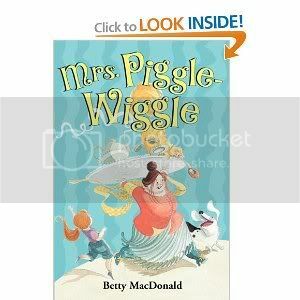 Mrs. Piggle Wiggle also has a series, but we I am eyeing Mr. Poppers Penguins by Richard and Florence Atwater. A loose adaptation of MPP in movie form, starring Jim Carrey is due out in June. I love all these books from so long ago. Just a simpler time. But of course there are lots of new series out worth looking at too. A trip to the library and/or bookstore to see what interests your slightly older kids is recommended. Happy Reading, everyone! If I've left off one of your favorites, leave a comment so we can all benefit. "Emmaline and the Bunny" by Katherine Hannigan. Enthralled all ages from 2-12 when daddy read it to them.